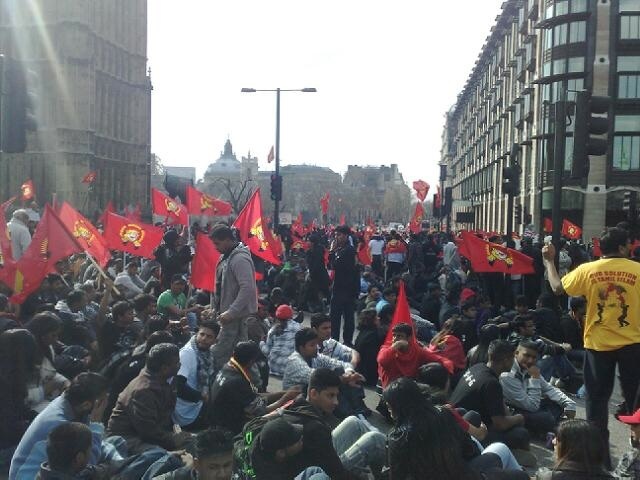 This weekend marks 10 years since thousands of British Tamils began a 73 day long continuous protest at Parliament Square in London, as the Sri Lankan government ramped up a military offensive that had already massacred tens of thousands. Following two weeks of protest outside the British parliament, the number of demonstrators escalated to thousands in response to the intensified shelling of Tamil civilians in the North-East of Sri Lanka. Thousands of protestors took to the streets and staged a sit down demonstration in front of the Houses of Commons. The weeks of protest took place alongside dozens of others in diaspora centres around the world. In London, British Tamils undertook hunger strikes, with at least two demonstrators jumping into the River Thames and another attempting to self immolate in front of the Houses or Parliament in protest at the British government’s lack of action in halting the atrocities. Read an eyewitness account of the events here and another from our profiles of May 2009 here. 03 March 2009 : Man sets himself on fire in the UK, Self immolation death toll hits 8 in Tamil Nadu.